Towboat RUTH arriving with barge at Birmingport, Alabama, 1939. The towboat RUTH arriving with a barge at Birmingport, Alabama, photo dated 1939. Built 1912 St. Louis, MO. 100 x 20 x 4.2. Engines rated 150 horsepower. In 1935 the RUTH was owned by Kingston Lake Gravel Co.,Capt. Henry Hulett, master. In 1929 the RUTH had been owned by the Yourtee-Roberts Sand Co.of Chester, Illinois and that same firm again owned her in 1945 and perhaps earlier. Operated by Yourtee-Roberts until 1963. Birmingport (or Port Birmingham), Alabama is a river port and rail terminal located on the Locust Fork of the Black Warrior River in northwestern Jefferson County on Alabama Highway 269 (Birmingport Road) south of Quinton. The port was developed in 1920 by the Port of Birmingham Company, with offices in the Jefferson Bank Building. 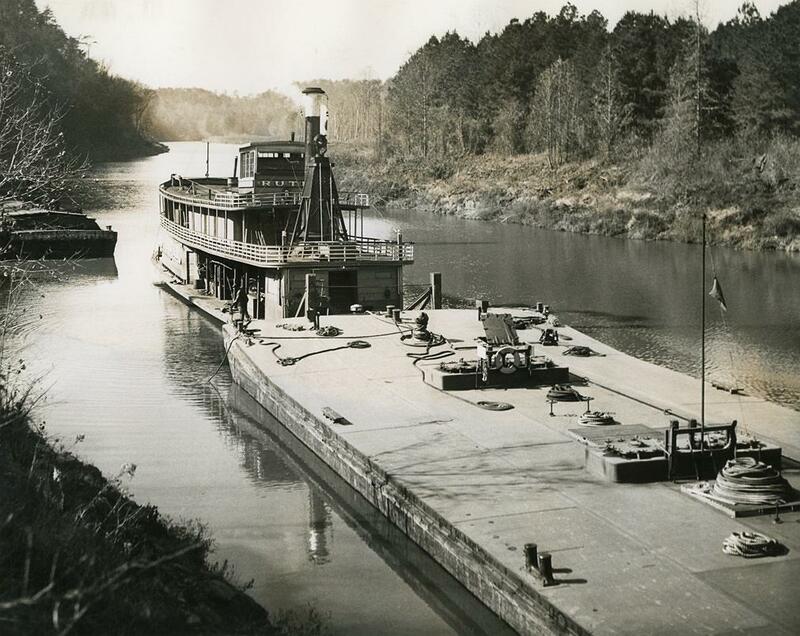 It was created in conjunction with the development of the Warrior River Barge Line, which permitted barge traffic from Birmingham to reach Mobile and New Orleans. Port activity stretches for about two miles along the banks of Locust Fork, primarily serving the steel and road construction industries with raw materials shipped north from Mobile by barge. The port's primary export is coal from the Oak Grove Mine. Rail access to the port is by the former Barge Line Railroad, now part of the Birmingham Terminal Railway operated by Watco (formerly known as the Birmingham Southern Railroad). Snap shot 3 x 4 3/4 inches, rubber stamped on the back THE SAUER STUDIO - Greenville, Mississippi - undated. 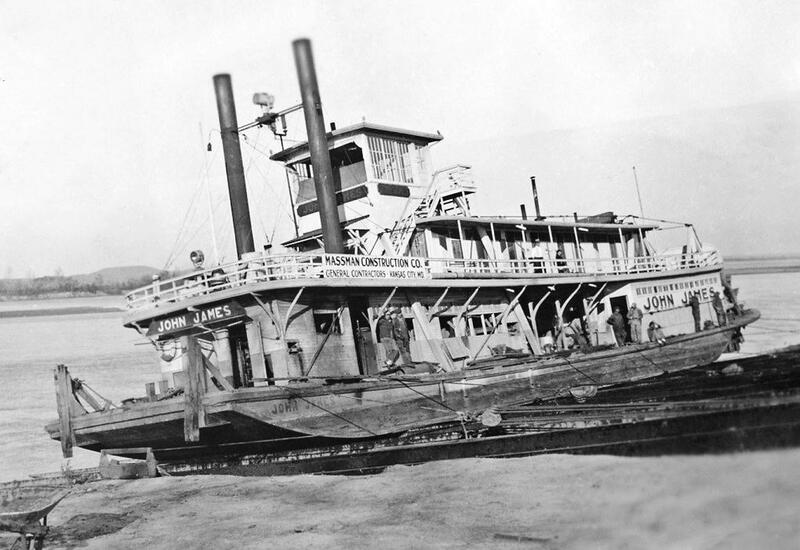 Sternwheel towboat 1927-1952. Originally the ISSAQUENA built at Jeffersonville, Indiana in 1912, 145.5 x 30 x 6. Renamed by United States Engineers at Vicksburg, Mississippi in 1927. The hull was rebuilt in 1934 with the addition of sponsons, 2 ft. by 98 ft. The cabin was rebuilt and the boilers converted from coal to oil burner in 1939-40. Four boilers by H. K. Porter, 250 psi. Sternwheel 23 ft. diameter by 21 ft. long, 15 buckets, 31 in. dip. Both as the ISSAQUENA and the TOLLINGER she was commanded by Capt. C. W. Roche of Helena, Arkansas. He retired in 1928, aged 70, having been on this boat 13 years. Died at Helena, Arkansas May 19, 1936. In 1929 Capt. R. O. Miller was master and Rhea Fuller was chief engineer. Sold at public sale to River Barge Ship's Service, Westwego, Louisiana in 1947 and was dismantled there in February, 1952. Wonderfully sharp and clear image from the 1920's with lots of contrast. 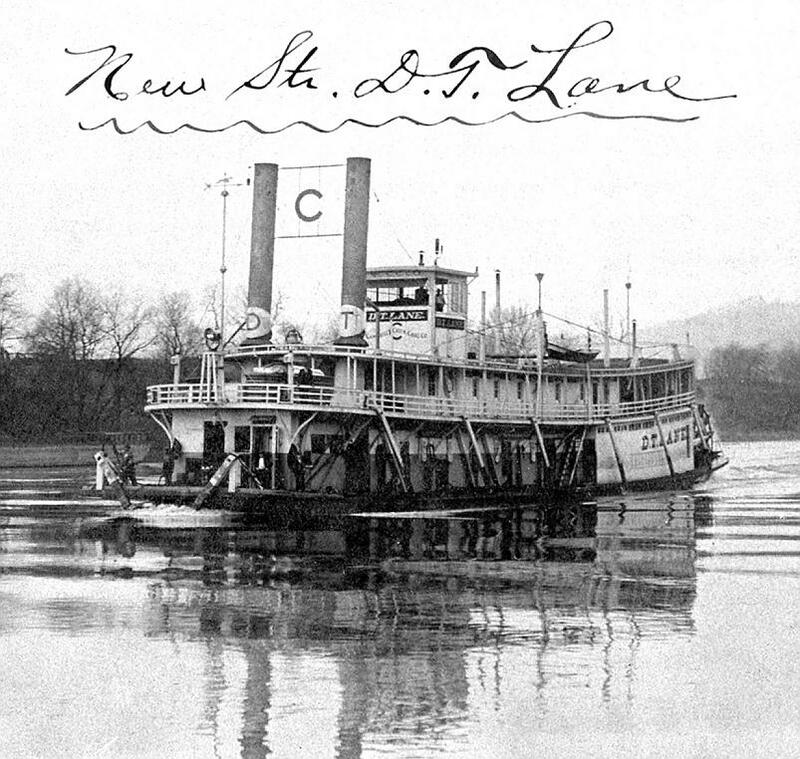 Sternwheel Towboat built at Marietta, Ohio in 1903, 119.4x24.9x4.6. Marietta engines 15's-5 ft. stroke. Owned by the Winifrede Coal Co. She was cut down by ice and sunk to the roof at Marietta while her engines were being installed. She towed coal out of the Kanawha until 1914 and then was sold to John Lyons at Middleport, Ohio. He kept her under the ice piers there for several years. In March, 1920 he sold her to the National Transportation Co., Pittsburgh, Pennsylvania. She was cut down to a pool style towboat and towed Monongahela River coal. Sank at the Tin Mill, up the Youghiogheny River above McKeesport, PA, on October 13, 1920. In a rebuilding program, she was renamed C. F. COLBERT. Written on the back of this 6 x 9 1/2 inch print in pencil: (Taken on the Kanawha River in) "Lock 4 miles below Chas. (Charleston, West Virgina) 1922"
Built in 1883 at Sewickley, PA (hull and cabin) and completed at Rees shop in Pittsburgh, 135.5x28.8x4.2. Engines by Rees, 12's-5 ft. stroke. Two boilers, each 44 in. by 20 ft. Built for the Mississippi River Commission. Rebuilt at Jeffersonville, Indiana in 1895, shortened to 130.7 x 28 x 4.8. Transferred to U.S. Engineers, St. Louis, 1906. 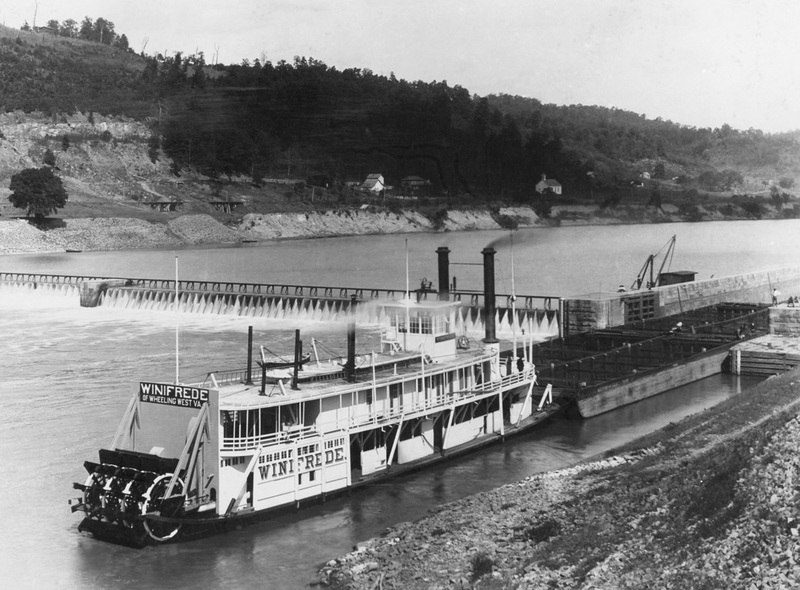 Sold at public sale 1913 and went to the Cumberland River where she ran as a packet, towing a barge. She was lost by stranding in Harmons Shoals, below Burnside, September 8, 1918 and the wreck still was clearly visible in the summer of 1941 during low water. Built in Dubuque, Iowa, 1888. Originally named REINDEER of Illinois State Fish Commission. She was condemned in 1901, rebuilt at Quincy, Illinois and renamed. Hull measured 139 x 26.6 x 4.8. Engines, 12's- 6 1/2 ft. Two boilers. The fish commission operated her until 1913 when Governor Dunn ordered her detached on the grounds that certain convivial politicians and their no less convivial ladies had abused the uses for which the boat had been intended. She was turned over to the Alton Division of the Naval Reserves. In 1925 was owned by the New St. Louis & Calhoun Packet Co., who used her both as packet and towboat. In 1929 sold to Phillips Bros. and on Sept. 30, 1930, she burned in mid-river above the mouth of Wood River, Alton, Illinois. There was rumor she had been in use as a distillery with a moonshine still aboard, and had been cut adrift when the Federals were about to arrive. A number of steam-driven sternwheelers help preserve some of the 19th century flavor of the Ohio. Steamboaters contemptuously say of newfangled towboats, "They don't have a decent whistle, only a bleating horn." 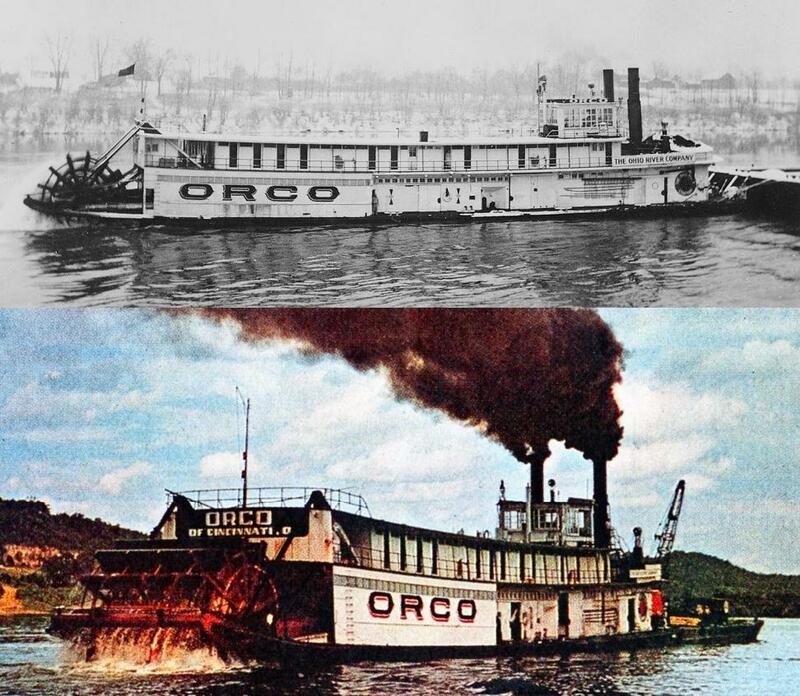 A clearer view of the starboard profile of the ORCO's in black and white is courtesy of Murphy Library at the University of Wisconsin - La Crosse Steamboat Collection Photographs. Thirty years ago, right before his 26th birthday, Bryan Boyd conceptualized an idea that would take him the next ten months to complete. It was a dream inspired by our East Texas history that included one of his favorite local towns, Jefferson Texas. He became inspired to recreate a scene out of history. 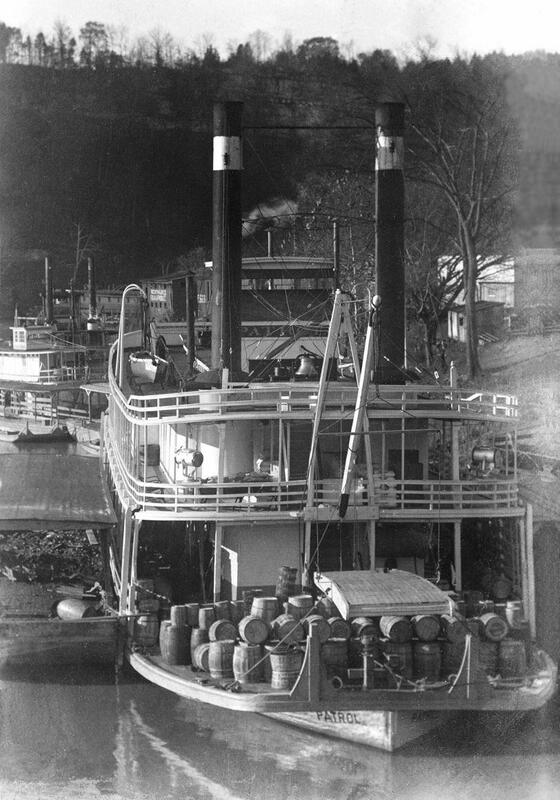 The Mittie Stephens was a steamboat that would occasionally dock in Jefferson with passengers and cargo on board. Bryan eventually learned that there was really no visual records of the historical event. He set out to research and recreate this moment in time. 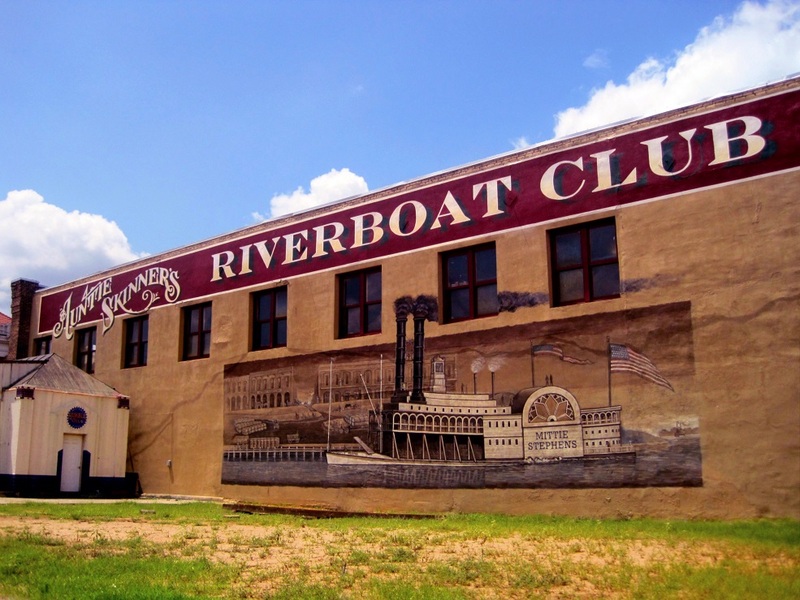 Photo by Suzy Guese of a mural featuring the ill-fated steamer MITTIE STEPHENS on an exterior wall of Auntie Skinner's Riverboat Club, a restaurant and bar in Jefferson, Texas on the Big Cypress River where steamboats traveled between the town and New Orleans. "Rollicking watering hole in a converted 19th-century warehouse with pub grub amp; music on weekends." Welcome to the City of Jefferson, Texas, "Riverport to the Southwest." At a time when steamboats plied the Big Cypress River from the Port of New Orleans, true Southern gentility was the order of the day. This sense of timelessness prevails even unto today. Let yourself be whisked away to a land not far away as you glide peacefully along in an open-air riverboat where Jefferson's colorful past comes alive. On February 12, 1869, a fire burned the MITTIE STEPHENS to the waterline in Caddo Lake. Robert Fulton won the technological race to find a way to utilize steam power for transportation when he successfully sailed the Clermont on the Hudson River 1807. He did not solve another problem: how to make such travel safe. When we remember steamboat accidents, most of us think about boiler explosions, which resulted from excessive pressure or faulty equipment, or both. But the boiler was working well on the side-wheeler MITTIE STEPHENS on February 12, 1869, and did not explode: instead, a fire burned her to the waterline in Caddo Lake near the Texas-Louisiana border. 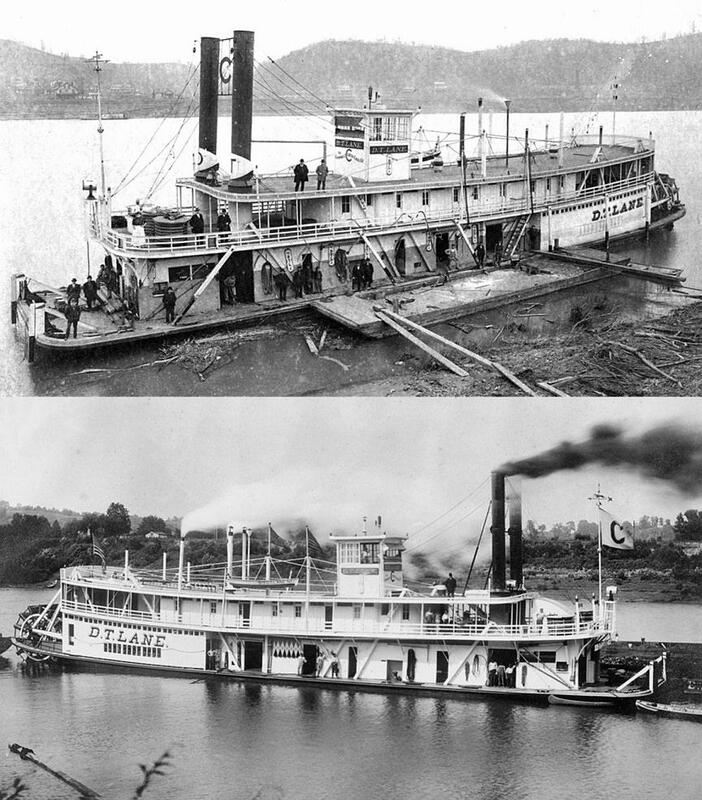 Steamboats became pervasive on America's inland waters during the first half of the nineteenth century. Moving passengers and cargo over water was also slower. But with only animal powered wagons, and after 1837 the "iron horse" railroads as competitors, steamboats proliferated and their owners prospered. Still, there was danger on the water. The MITTIE STEPHENS came out of a shipyard in Madison, Indiana, in 1863, in time to be a part of the effort to preserve the Union. She served as a naval packet for a year, but after the failure of the Red River Campaign in 1864 she was sold. 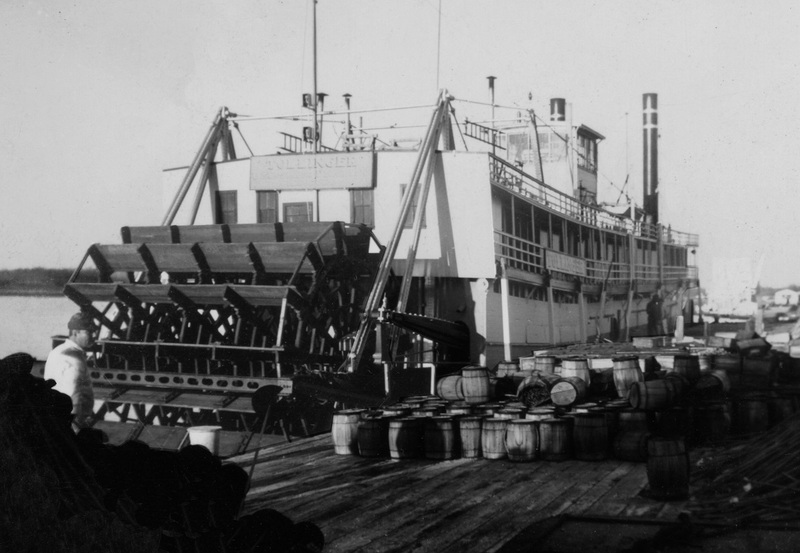 Civilian owners used her on the Missouri River and then stationed her in New Orleans. In 1866, the STEPHENS began regular round trips between New Orleans and Jefferson, Texas, via the Mississippi and Red rivers and Cypress Bayou. Her last voyage began on February 5, 1869. 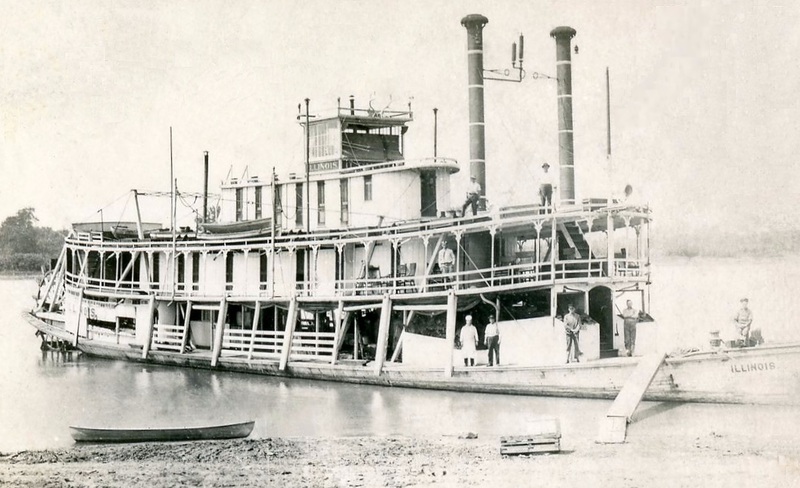 Seven nights later, she steamed on Caddo Lake near her destination with 107 passengers and crew, plus cargo, which included hay stacked on deck. Sparks from a torch basket located on the bow to illuminate the ship blew in the wind to the dry hay, ignited, and a conflagration resulted. The helmsman steered for shore but the ship "grounded." That meant that passengers might have saved themselves by jumping overboard and wading to shore. But the side-mounted paddlewheels kept turning in an effort to force the ship on to shore, and many who leapt overboard were sucked into the wheel. Sixty-one people perished. The STEPHENS burned to the water line, though parts of her, including the bell, and some machinery, were salvaged. Her remains remind those who visit the lake of the dangers that await those who move upon the waters well into the twentieth century. I have reformatted the upper portion of page 10 of one of the 1955 issues of the JOURNAL, including only the openingof the story and replacing the screened image that was there with a sharp file of the same photo from La Crosse andupgrade the outline in the same style that the original had. Below is a text scan of the article itself. The Editors Note at the end of the article promises a follow up story on the Jayhawker which I will look for and if it isin this same collection of the first half of JOURNAL issues for 1955 I will make a text scan of that and supplement this one. 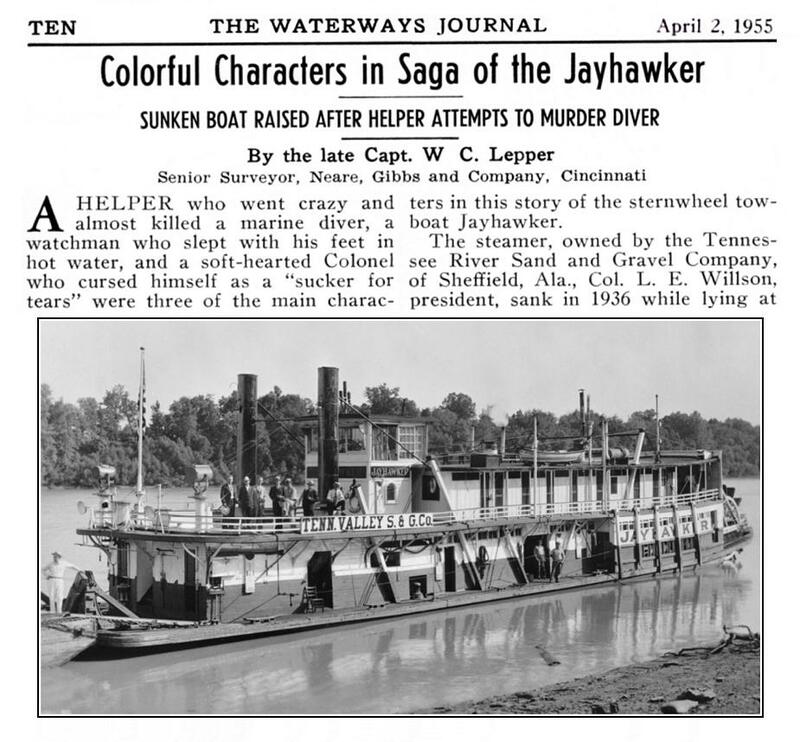 SUNKEN BOAT RAISED AFTER HELPER ATTEMPTS TO MURDER DIVER"
A helper who went crazy and almost killed a marine diver, a watchman who slept with his feet in hot water, and a soft-hearted Colonel who cursed himself as a "sucker for tears" were three of the main characters in this story of the sternwheel towboat Jayhawker. How did it happen? Well, here's the crew's story. The captain, whose name was Snodgrass, said: "We arrived at the landing at dusk. I ordered my crew to put out head, spring and stern lines. "Before I left for home all was well." Engineer Hashut stated, "There was water in the boilers and the fire was banked." Mr. Ketchum, the steward, said, "I left for home as soon as we arrived. Everything was all right when I left." "I was soaking my feet in hot water when suddenly the boat went down. I was so frightened I upset the tub of water, climbed ashore and walked home in my bare feet, over a mile. I need shoes but I certainly am not going to ask the Colonel for them. He thinks I am guilty of the accident." The watchman was right about Colonel Willson for he did think he was guilty. Four days later, Mr. Turnout admitted it. He said he had been soaking his feet in hot water when all at once the water turned cold around his knees and he realized it was river water coming in through the bottom of the boat. Had he been awake he might have noticed the odd motion of the vessel as the wind drove the hull against a pointed rock, opening a seam. This sleeping watchman, it was claimed, never started the pumps which might have saved the vessel. Colonel Willson was more disturbed about his own soft-heartedness than about the temporary loss of the Jayhawker. A sad story from Mr. Turnout's wife had resulted in his employing the man. Then, the morning after the boat sank, Colonel Willson arrived at the Turnout home intending to give the man the thrashing of his life. Instead, all he gave anyone was 10 dollars. This went to Mrs. Turnout for her hungry children. Mr. Turnout, himself, had left town. The boat was lying in eight feet of water at the head and 10 at the stern when diver Joe Sartis and I arrived at the scene. It had been forced into the shore by a very swift current from a cross dike in the canal. This swift current made the bulkheading of the boat with two-inch lumber extremely difficult. But we finally bulkheaded as high as the boiler deck with the help of the diver's helper, or tender, a man whose peculiar French-Italian name had been shortened to "Bucket." On the second day of the bulkheading operation, Mr. Sartis was down in the water nailing the bottom of the bulkhead while fighting the swift current that ran along the outside of the boat. Suddenly Bucket dropped both the air hose and the lifeline. Grabbing up a hatchet and screaming at the top of his voice he started for the air hose. Had he brought the axe across it the diver, down below, would have died within a few seconds. I never played football but right there I tackled Bucket, hatchet and all, as he came across the deck screaming, "Oh, me! Oh, me!" We soon had him subdued and crying. We subsequently learned he was subject to fits. He was sent home to New Orleans where he was killed a few days later by a fall down stairs, the apparent result of another fit. Having replaced Bucket with another helper, work was resumed on raising the Jayhawker Two men were detailed to place the canvas required by the job since I came to believe that the worry of placing that canvas cover had "unhinged" Bucket. Soon the Jayhawker was pumped out and returned to the landing. She was fully repaired and ready to re-enter her regular trade along the Tennessee River. For the next four years Lady Luck smiled on the Jayhawker until one night in 1938. But thereby hangs another tale to appear soon in these columns. NOTE : Several years ago the TVA completed canalizing the Tennessee River and locks and dams now make the river navigable from Knoxville to the mouth, Sheffield lies between Wilson and Pickwick dams. Both dams, particularly Pickwick, control the river at that location. The sinking of the Jayhawker occurred before Pickwick Dam was completed and boats were still using the long, treacherous and rocky Sheffield Canal which ended at the Sheffield city landing. The Jayhawker had originally been built out of the Greene Line packet Chris Greene (first) which had been destroyed in a fire at Cincinnati in 1922. The hull, 120 by 26.4 by four feet, was used as well as the non-condensing engines. The new boat was named Ben Franklin No. 2 which was sold in 1930 to the Tennessee Valley Sand and Gravel Company and renamed the Jayhawker. She sank twice and was raised, once in 1936, as related in the above story, and again in 1938, as will be related in a forthcoming story. In 1939 she sank for the third time, at Mile 240.5 on Tennessee River, and was a total loss. On September 11, 1936 she sank in 10 feet of water in Sheffield Chute on the Tennessee River, having gotten out on one of the old walls after the Pickwick pool was filled. Raised on September 19, 1936. In January 1938, she was stranded above Chattanooga halfway between the Southern bridge and Chickamauga Dam and looked like she might break in two, but was rescued. Sank on January 25, 1939 and was lost. Captain F.G. Voight (master, 1936); Tom Utter (pilot, 1936); J.B. Carroll (chief engineer, 1936); Herb Lassiter (2nd engineer, 1936) and J. Red Brewer (steward, 1936). Had engines from the prior D. T. LANE although both of these boats had pilothouses on the roof, the second D. T. LANE had her cabin cut off short forward. Captain William H. Patrick long was master, with Wesley Summerfield pilot. Inherited from the earlier D. T. LANE, her whistle was a small, two-toned one with a high pitch; part of it was lost overboard September, 1926; she then acquired the old J. T. HATFIELD "wildcat". She was retired at Dana, West Virginia and sank there in June, 1934 but was raised and lay out of operation for another year or so. She finally was dismantled at Dana in October, 1937, ending 66 years of there having been a boat named D. T. LANE on the Kanawha River. Unusual real photo postcard. Scan came through with warm and cool tones. It's just in from eBay. Built in 1899 at Dubuque, Iowa for $24,800. In October 1901 she burned her cabin and pilot house off at O'Donnell's Landing, Arkansas below Cairo. She was transferred to USE, St. Louis in 1905 and then transferred again to USE (or could that be USACE for the United States Army Corps of Engineers? ), Memphis by 1917. In April 1926 she made a trip to St. Paul with five barges loaded with water ballast to test the possibility of an upper Mississippi River extension of the Federal Barge Line. At Island 17 the barges went aground and after they were freed the General Ashburn completed the trip. 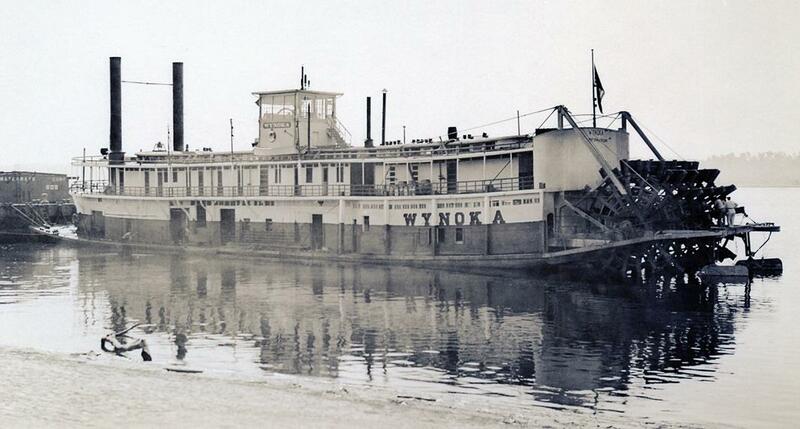 On August 4, 1929 the WYNOKA hit a rock and sank near the Rock Island bridge. The boat was repaired at Keokuk. She took part in the dedication of the new Peoria, Illinois terminal in June 1931. Sold to the Bissos and renamed BISSO in 1935. "On the ways" at Gasconade, Missouri, 1933. The JOHN JAMES is either being pulled out of the river or being lowered back into it.